Ever since its domestication more than 5,000 years ago, the Saluki dog has been a companion to desert people in the Arabian Peninsula. Indigenous to the region, the dog’s speed, intelligence and loyalty have made the Saluki much beloved by Bedouin, who have used the dogs for hunting and guarding, among other services in daily life. The Saluki dogs can run extremely fast, reaching speeds of up to 75 kilometers per hour, and can maintain these speeds over extended distances of up to three miles. Arabian Saluki Centre of Dubai (ASCOD) is a non-profit organization that has been operating in the UAE since 2009. 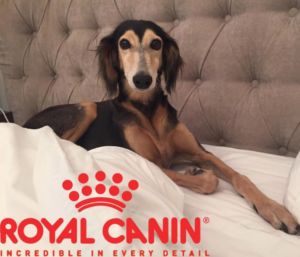 They are an independent Saluki rescue group that has been incredibly successful due to the support of members of the public and contributions by Saluki lovers. With the help of their network, ASCOD rescues, fosters and adopts both Salukis and other hounds, providing medical treatment and rehoming them. Whilst some are adopted locally, most rescued Salukis find loving homes in places like Europe, USA, Canada and Russia! The group depends heavily on dog-loving families in the UAE to offer foster homes for their rescues. These families work to rehabilitate and train the rescued Salukis so that they will readily fit into their future forever homes. Unfortunately, many dogs rescued by ASCOD are often underweight or malnourished. Royal Canin is delighted to partner with ASCOD, giving us the opportunity to feed a number of dogs rescued by the group. We provide ASCOD with specialist diets for dogs with specific nutritional needs, whilst our complete and balanced, premium canine nutritional products goes to dogs in foster homes to help keep them looking and feeling healthy! Through this special partnership, we hope to improve the lives of many more beautiful Salukis in the future.